I've always loved decorating and creating a lovely space in my home. I'm quite passionate about it, actually. For months I've noticed that my dresser top has been piled high with Dunitz & Company fair trade jewelry. I seem to always be bringing something home to wear here and there. Many of the designs at home are what I call "vintage". 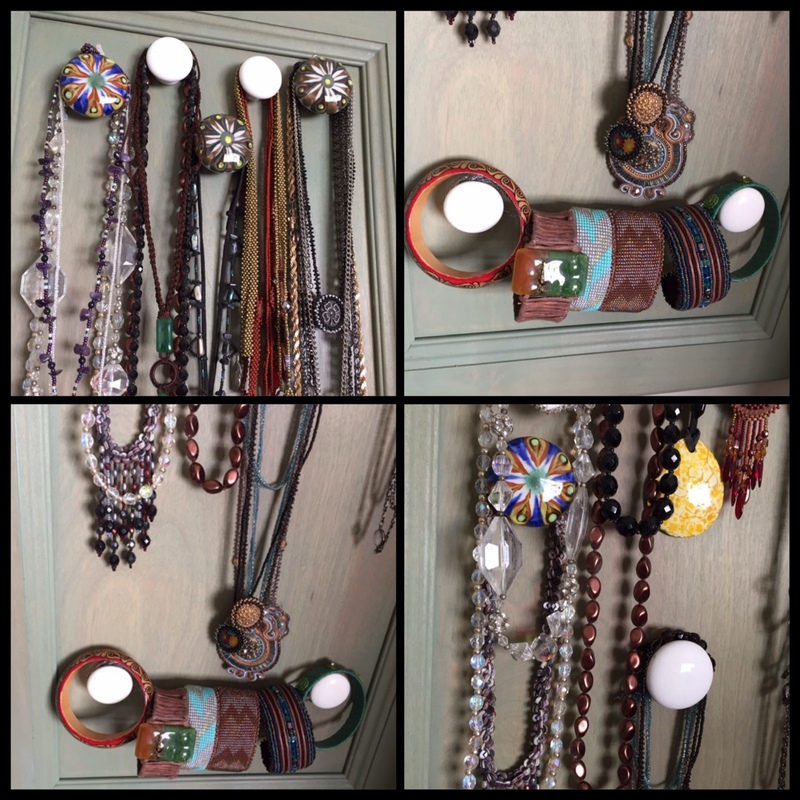 I've been designing our jewelry line since the early 90s - & many of the pieces on my dresser are - for me - ancient. These pieces are quite beautiful, just not part of the current line. Others are from the season we're showing now. 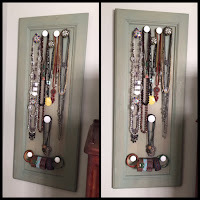 The thing is, with so many pieces of beaded and fused glass jewelry piled up, I don't even know what's there. And, yes, I do have a few pieces that pre-date Dunitz & Company and belonged to my mom. What to do? 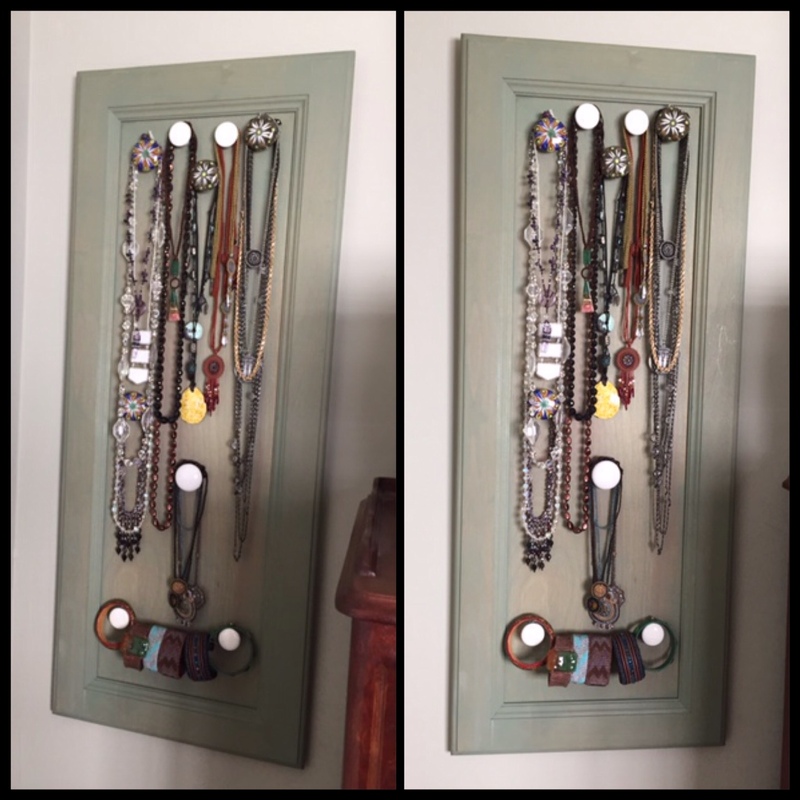 I decided to create a DIY necklace board I could hang in my bedroom. My goal was to do this without purchasing a single thing. This was my weekend challenge! 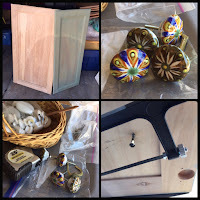 The inspiration components for my project were four door handles I purchased from the ceramic artisans of San Antonio Palopo, Guatemala many many years ago. (A couple of them are actually signed by the artist that made them.) 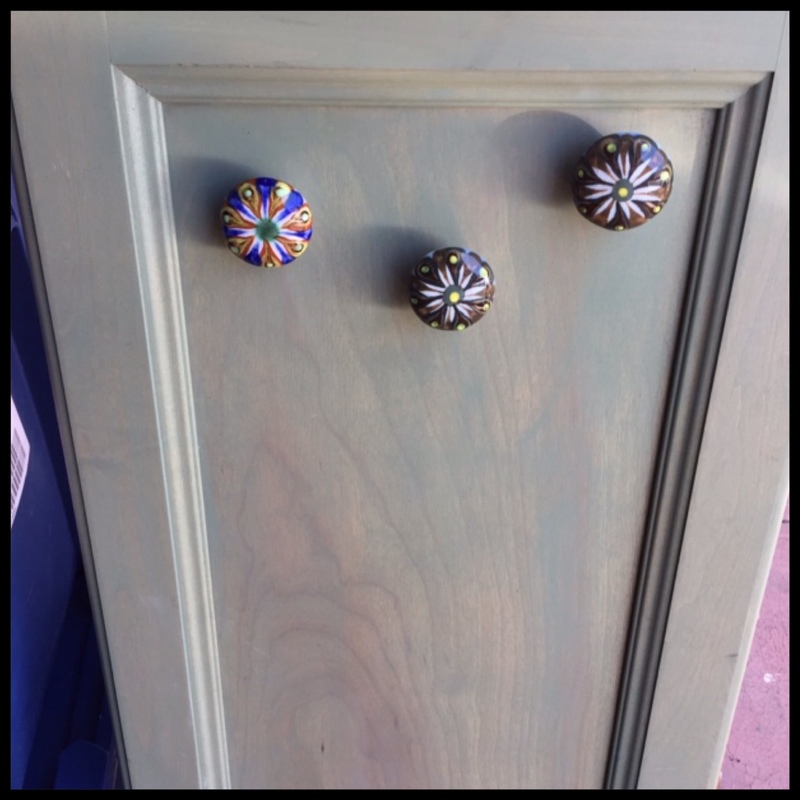 When I bought and fell in love with these knobs, I always thought they'd be perfect somewhere in my home. Until this moment, I never found the appropriate place for them. I hunted around my home looking for other DIY components. I'm not exactly a hoarder. I do however tend to not throw away things I believe I can use later. Nearly twenty years ago, I remodeled my kitchen. At the time, the project carpenter had made some cupboard doors the wrong size. Of course, I kept them. I actually stained my kitchen cabinets green. (Yes, I did it myself.) 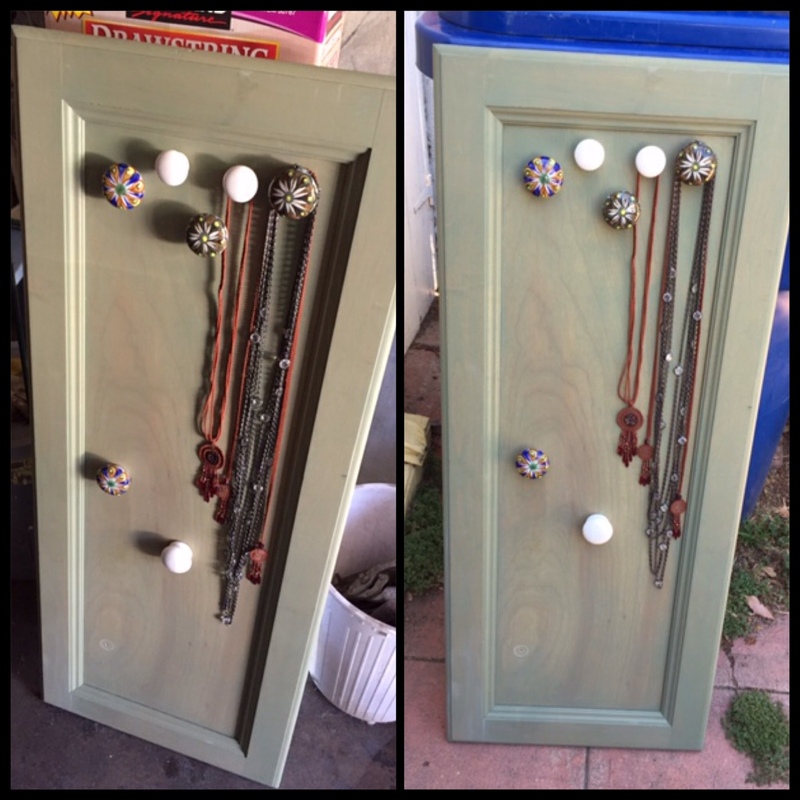 I mixed my stain and tested it on one of the extra doors. Voila. This became the base for my new jewelry display. 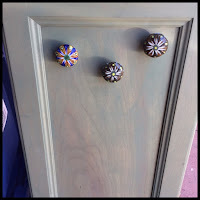 I also had several white porcelain knobs I salvaged from the old kitchen and an old bathroom. 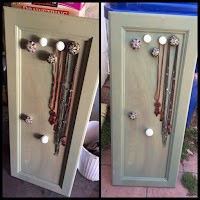 Lots of picture frame wire, screws of varying sizes, a hacksaw and my drill... and I was ready to wing it and go! Most of the knobs you purchase in the USA have the screws entering from the back of a door and screw into the knob. Not the San Antonio Palopo knobs. These were just the opposite. Kitchen cabinet doors are quite thin compared to room doors. I had to cute the screws with a hacksaw once I attached the knobs. For the white porcelain knobs, I hunted and hunted for smaller screws. My slightly too long screws were adequately tightened by adding nuts by the screw heads. Yes, I'm resourceful. Finally, I wrapped some thick picture framing wire around the lowest knobs. 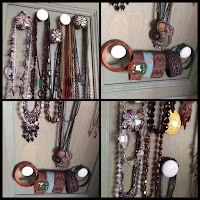 This allows me to hang a few fair trade bracelet cuffs on my new display.